Situated in Parga, Bacoli Studios is a 7-minute walk from Parga’s centre and 7-minute-walk from Kryoneri beach. The complex offers free Wi-Fi and features an outdoor pool, hot tub, and air-conditioned rooms with private balconies. All guest rooms include TV, safety deposit box, hairdryer, refrigerator, and a fully equipped kitchen. 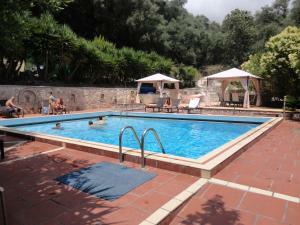 Bacoli Studios is within walking distance from the several shops, cafes and traditional taverns of picturesque Parga. The nearby Valtos Beach is 0.9 miles away. Guests of Bacoli can relax in the hot tub or by the pool area, and enjoy views of the surrounding area from their private balcony or veranda. Ioannina National Airport is 55.9 miles away from Bacoli Studios. Free on-site parking is available. When would you like to stay at Bacoli Studios? House Rules Bacoli Studios takes special requests – add in the next step! Bacoli Studios accepts these cards and reserves the right to temporarily hold an amount prior to arrival. We need at least 5 reviews before we can calculate a review score. If you book and review your stay, you can help Bacoli Studios meet this goal.